The sudden, catastrophic break-up high over the Sinai Peninsula of a Russian airliner filled with returning Red Sea vacationers was consistent with an explosion or massive structure failure. The Airbus 321 was torn apart, scattering bodies and flaming wreckage along a 10-kilometre-long trail of destruction. All 224 – including 17 children – on board the St. Petersburg-bound flight from the Egyptian resort city of Sharm el-Sheik were killed Saturday less than 24 minutes after a predawn take-off as the twin-engined jet neared its cruising altitude above the remote, mountainous, central Sinai. Whatever rent the Airbus, there was no mayday call from the Russian pilots nor any prior communication suggesting engine, flight control or weather problems. Radar tracking indicated nothing unusual about the steadily climbing blue-and-white jet until the routine positional data stream suddenly terminated and the 18-year-old jetliner plummeted in pieces, some burning. The tail appeared to have ripped away early in the breakup sequences and was found nearly three kilometres from the main debris field. “The destruction happened in the air, and fragments were scattered over a large area of around 20 square kilometres,” said Viktor Sorochenko, head of the Russian-led Intergovernmental Aviation Committee but he declined to speculate about bombs or terrorism. “It’s too early to talk about conclusions,” he said. The two so-called black boxes – the flight data recorder and the cockpit voice recorder – have been recovered. 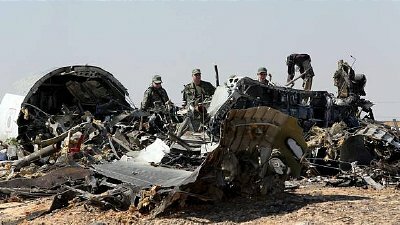 Egypt will lead the crash investigation, while Russian and French investigators have been invited to participate and were at the crash site Sunday. Despite a claim by an obscure Islamic State affiliate, backed up by a grainy video posted online that purported to show the stricken airliner ablaze and plummeting, there was no evidence linking the crash to the Sunni jihadi group, which usually backs up its propaganda with professionally edited, high-quality video. The Russian Metrojet Airbus A321 was far too high – nearly 10 kilometres up and nearing its assigned cruising level of 9,500 metres 31,000 feet – to be hit by the small shoulder-fired missiles that have sparked widespread fears among aviation and security experts since hundreds of the so-called Manpads (Man Portable Air-Defense System) were looted after the collapse of Moammar Gadhafi’s brutal regime in Libya in 2011. Although the Egyptian military has large numbers of bigger surface-to-air missile systems, there’s no evidence that it has lost control of any during its ongoing counterinsurgency against Islamist groups in the Sinai. Getting a bomb on board would require either a failure of Egyptian security screen at Sharm el-Sheikh or the complicity of baggage handlers or aircraft service crews at the Red Sea city, where there have been previous bomb attacks on hotels as recently as 2005. The Egyptian government, keenly aware of the damage its reputation will suffer if it emerges there were security lapses at Sharm el-Sheikh airport or that terrorist groups are capable of downing airliners from its territory, attempted to dampen speculation. Still, the sudden catastrophic breakup at cruising height – evocative of the bombs that downed Air-India Flight 183, killing more than 300 Canadians off Ireland in 1985 and Pan Am 102 that blew up over Scotland in 1988, killing 270 including 11 on the ground in Lockerbie, or last year’s Malaysian MH17 blown up over Ukraine killing 298 – is grimly consistent with either a bomb inside the aircraft or a missile shoot-down. High altitude flight is statistically the safest phase of flight with most crashes occurring during landing or takeoff. “Once you’re in cruise, many of the risks that exist at lower altitudes, from bird strikes to running into things, don’t happen,” said Todd Curtis, director of the Airsafe.com Foundation. The Air-India and Pan Am flights – both Boeing 747s – were destroyed by bombs placed in luggage and missed by security staff in Vancouver and London respectively. The Malaysian Boeing 777 was hit by a large Russian-built radar-guided BUK surface-to-air missile fired from eastern Ukraine in the control of Russian-backed rebels. Investigators in Egypt will look for traces of explosives residues and the tell-tail curling of aircraft aluminum indicative of blast-driven shrapnel puncturing the fuselage. They will also closely examine the tail of the Airbus A321 which was repaired after it suffered significant damage when the underside of the rear fuselage slammed into the runway during a bad landing in Cairo in 2001. The aircraft, then owned by Beirut-based Middle East Airlines, was out of service for months for major repairs. In at least one previous air disaster, a faulty repair of a rear pressure bulkhead that – seven years later – failed at altitude, ended in disaster. In 1985, the rear pressure bulkhead failed, blowing the tailfin off a Japan Airlines Boeing 747 and, although the pilots managed to keep the airliner aloft for more than half an hour, it eventually crashed into a mountain killing 520 passengers and crew. Four survived. Unlike a loss of awareness accident, such as the Air France flight from Rio de Janeiro to Paris in 2009, when three pilots argued about which way was up while their undamaged and perfectly flyable Airbus A330 fell for several minutes before smashing into the Atlantic, killing all 216 on board or a pilot-suicide like Lufthansa’s budget airline Gemanwings A320 when co-pilot Andreas Lubitz locked the captain out of the cockpit and deliberately flew the jetliner into the French Alps killing himself and 149 others last spring, the mid-air breakup of a modern airliner resulting in a scattered debris field usually indicates a cataclysmic event. On Sunday, several airlines including Air Arabia, Air France, Emirates flyDubai and Qatar Airlines rerouted flights to avoid the sparsely populated Sinai Peninsula pending a determination that no surface-to-air missile had downed the Metrojet flight. Separately, Russia’s civil aviation authority grounded Metrojet’s other nine Airbus A321 and A320 aircraft pending a review of the company’s maintenance procedures. The airline’s official name is Kogalymavia and it began operations three years ago. Meanwhile in Russia on Sunday, President Vladimir Putin declared a nationwide day of mourning, and in St. Petersburg, home to many of the victims, hundreds attended church services and dropped flowers, stuffed animals and candles at the city’s airport.